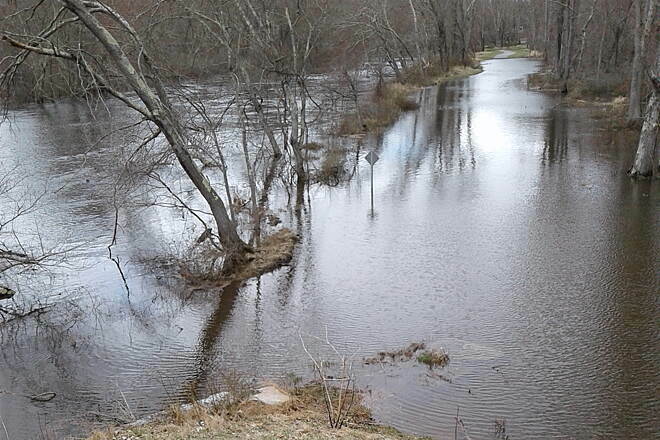 The Willimantic River flooded its banks on April 16th 2018 making the connection between the Air Line Trail South and North and the Hop River Trail impassable. 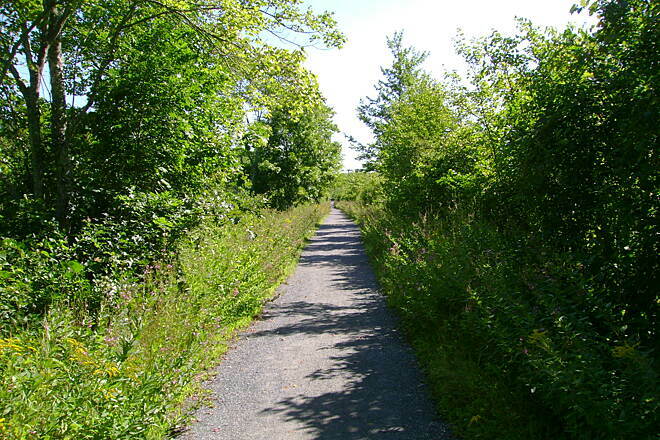 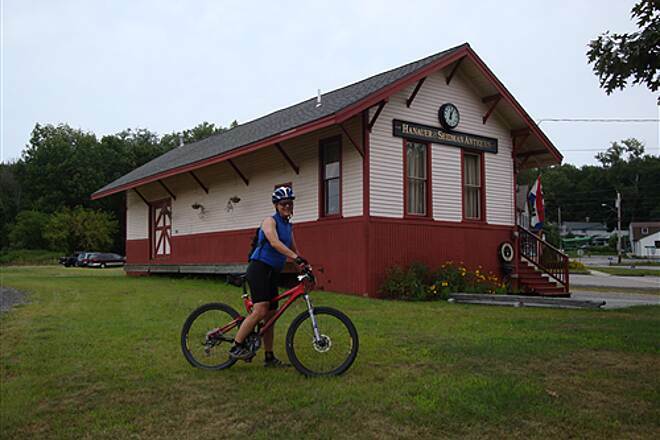 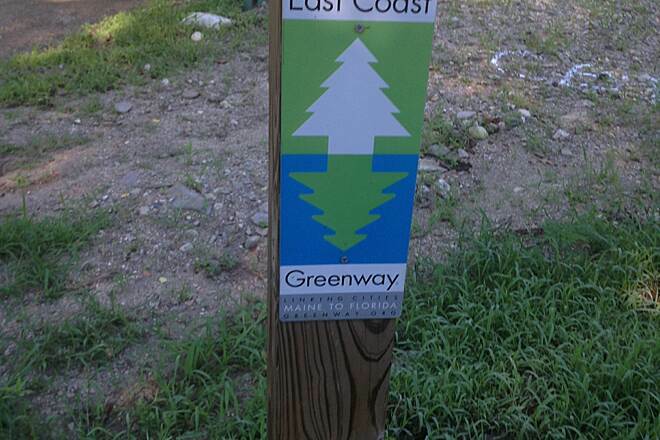 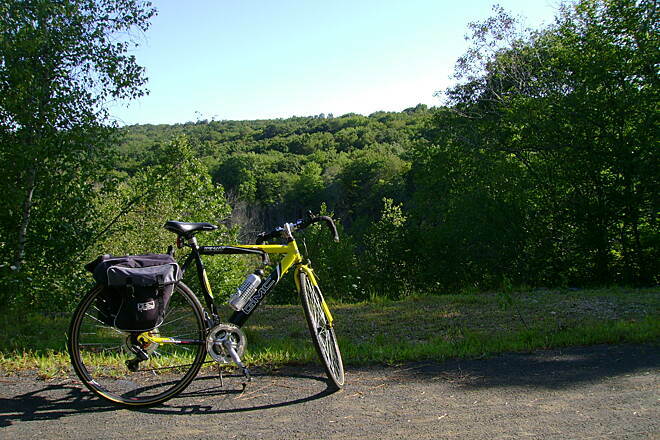 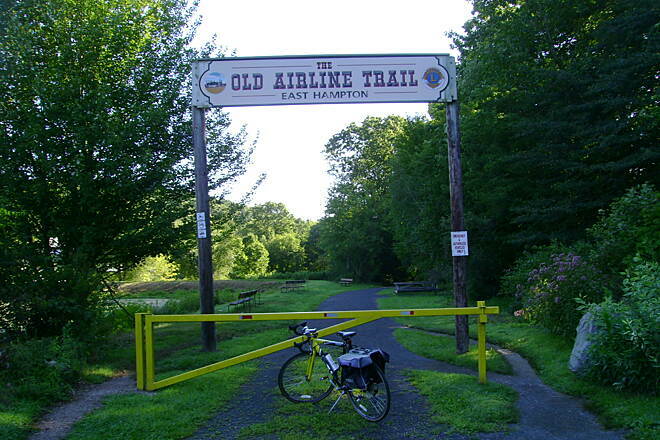 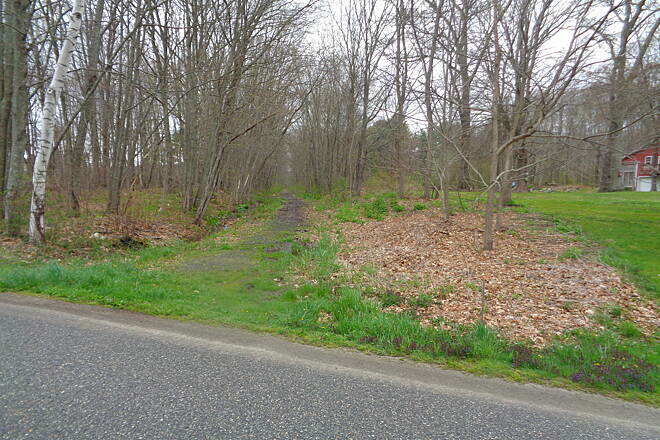 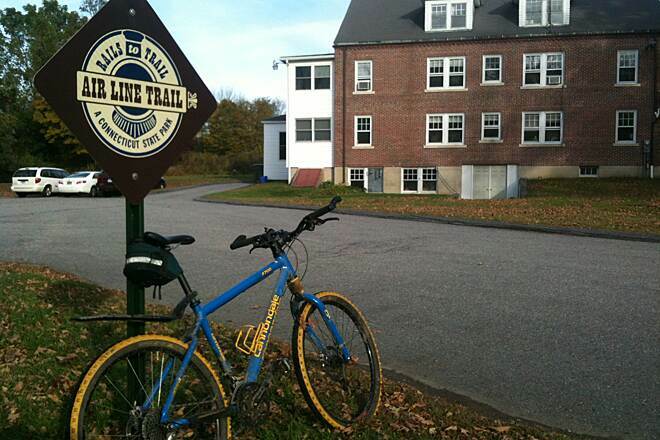 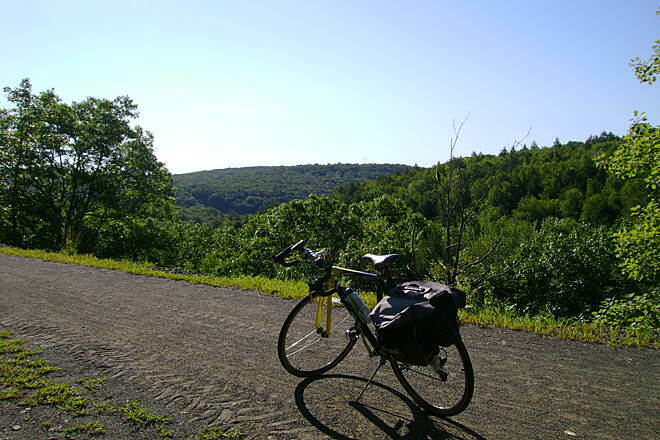 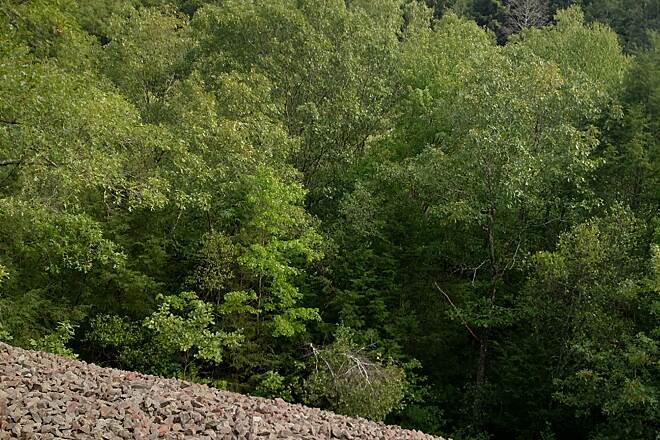 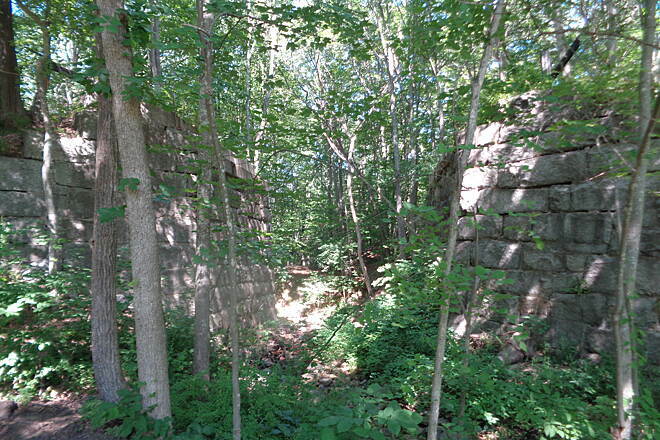 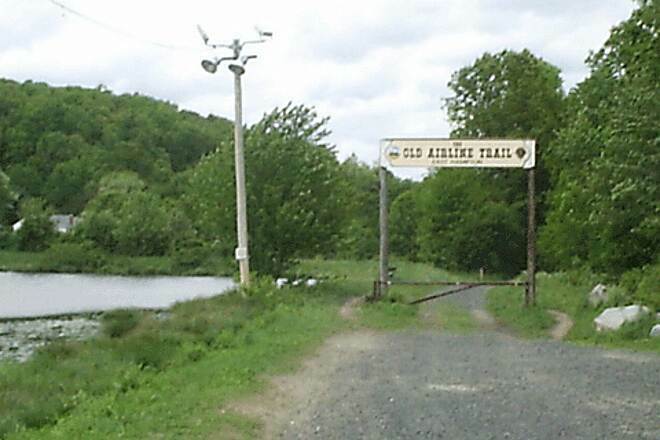 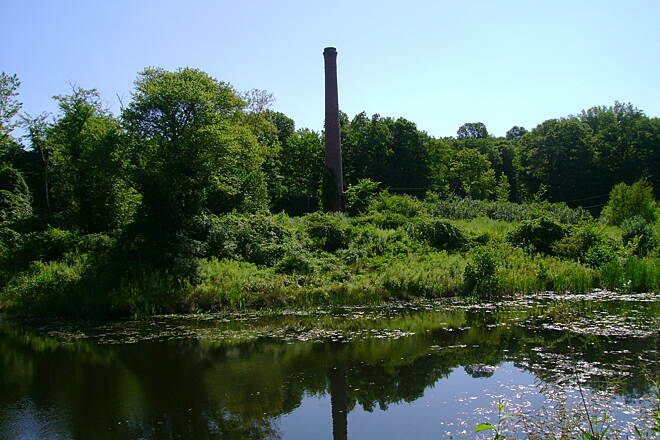 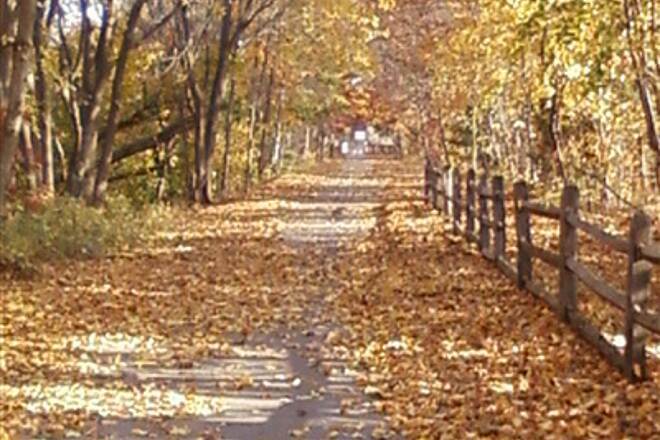 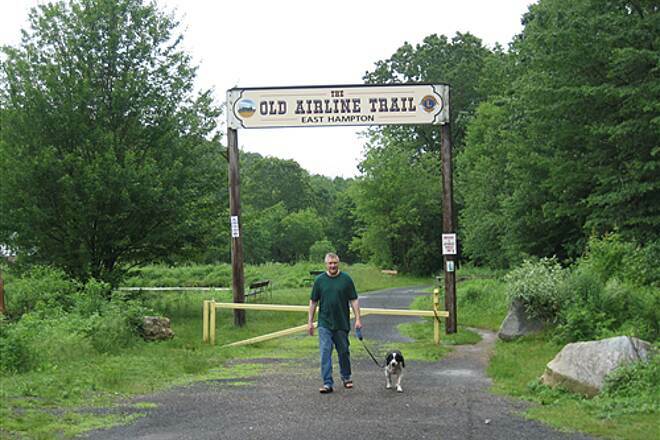 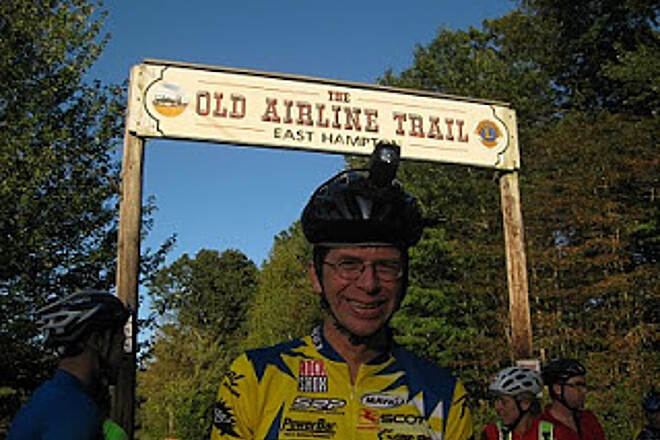 This image was taken at the junction of two rail-trails -- the Hop River Trail and the Air Line Trail -- in Willimantic, just north of the bridge over the Air Line Trail. 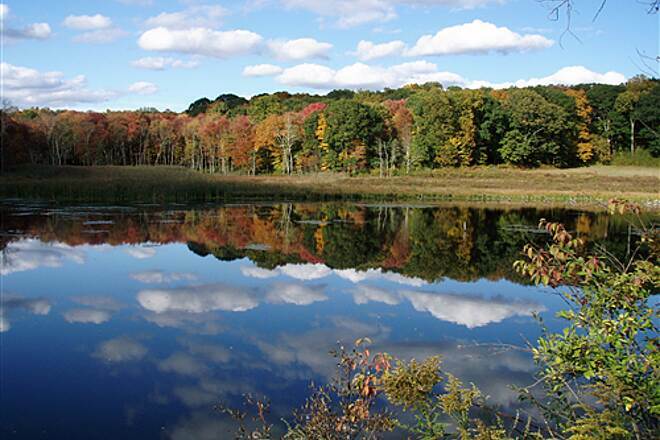 Photo by Bob Youker. 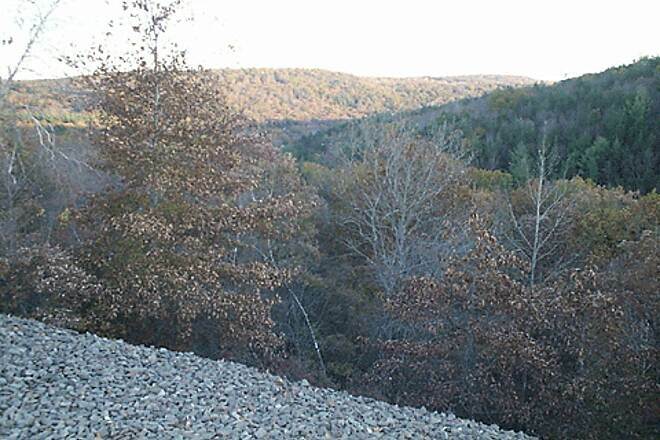 View from trail looking toward Lebanon. 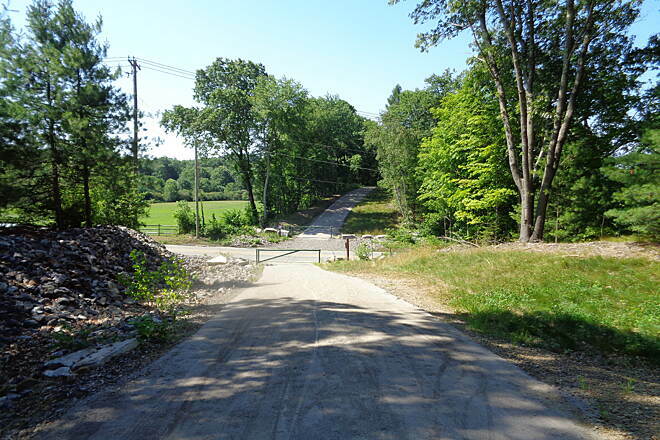 View looking south of the Air Line crossing Route 193 in Thompson showing the newly applied stone dust surface on both sides of the highway. 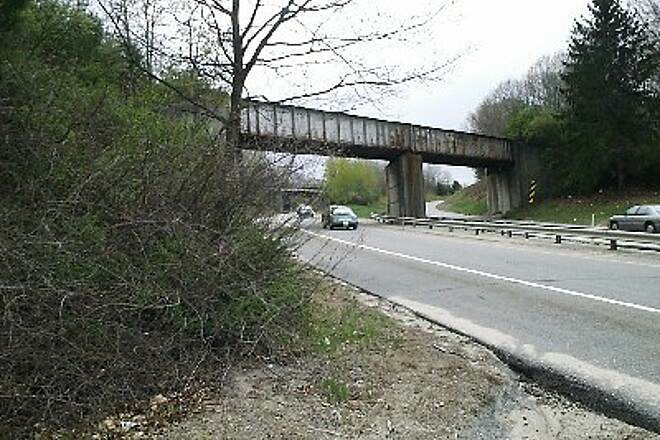 Bridge over the ramps connecting Route 12 to I-395 in Thompson. 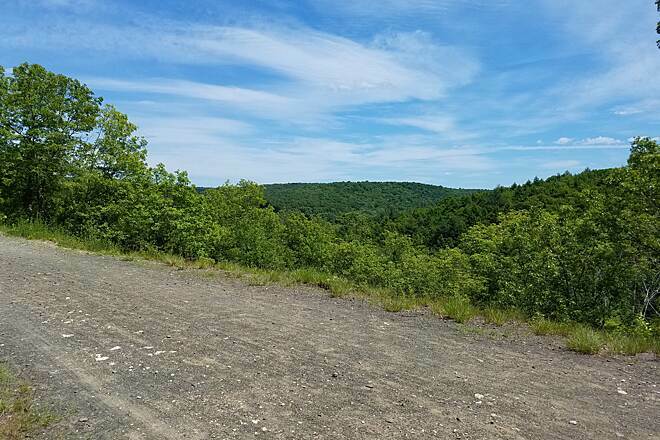 View is northeast on 7/23/16. 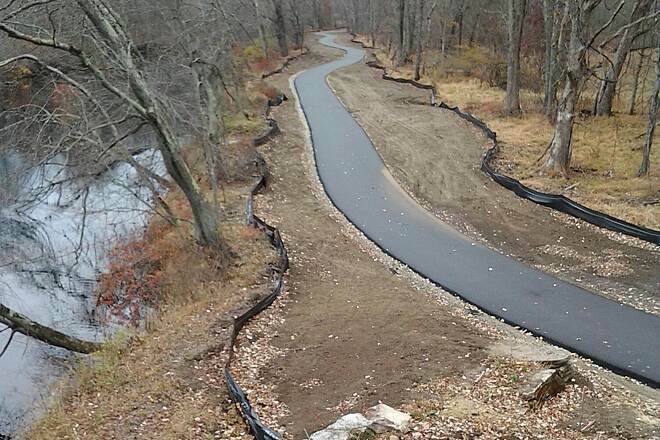 In the view is the newly applied stone dust trail surface. 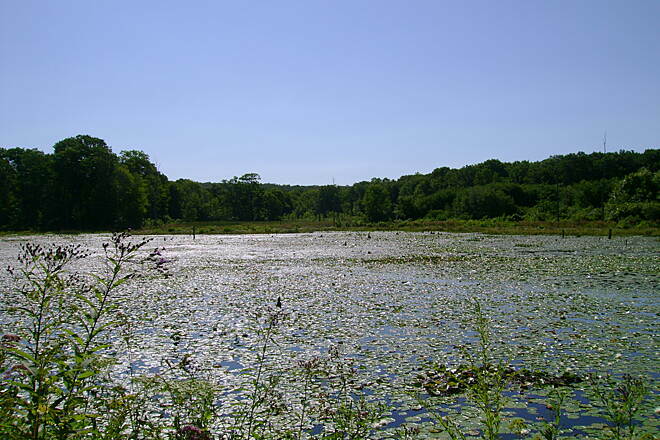 Just east of the Rte. 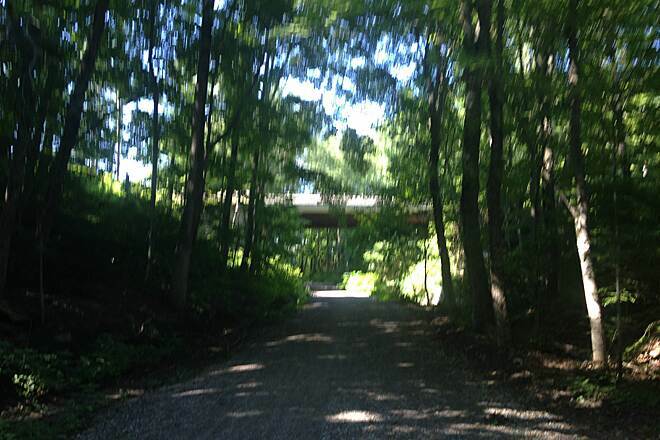 12 to I-395 ramps is this missing bridge in Thompson viewed 7/23/16. 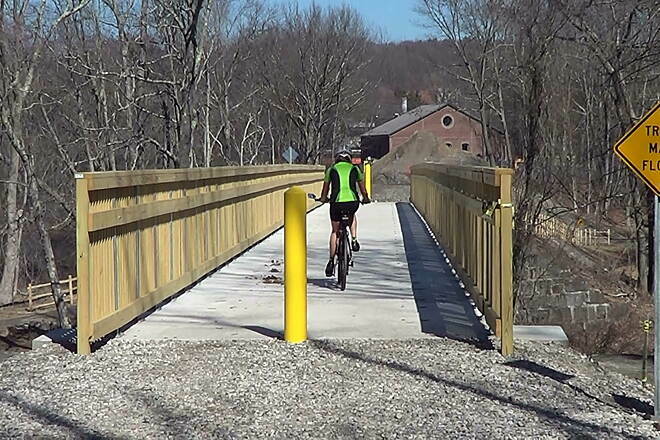 Stone dust trail now extends south from here to Mechanicsville. 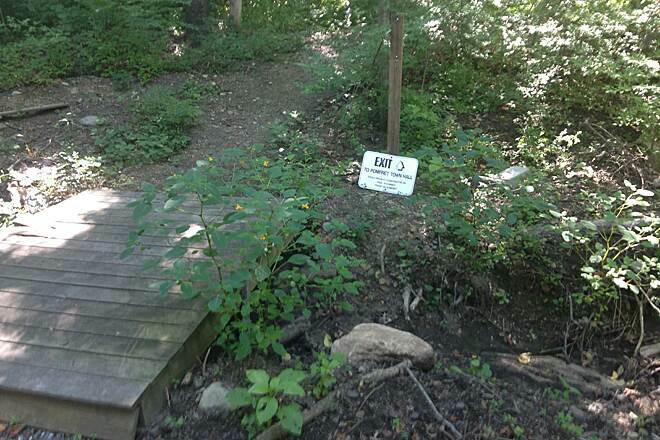 It is hoped to span this gap in 2016. 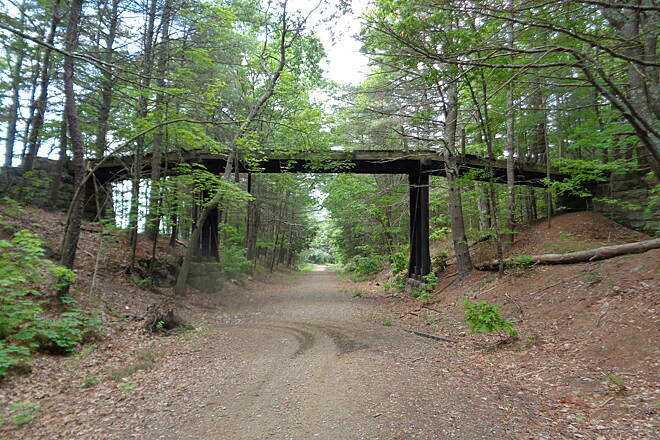 Looking west at old cattle bridge over the Airline, just west of the MA/CT state line in Thompson, CT 6/4/16. 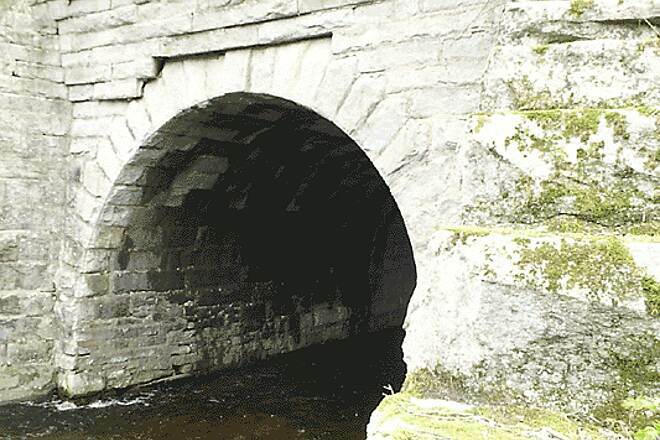 Bridge is very near an old buried stone enclosure of unknown origin. 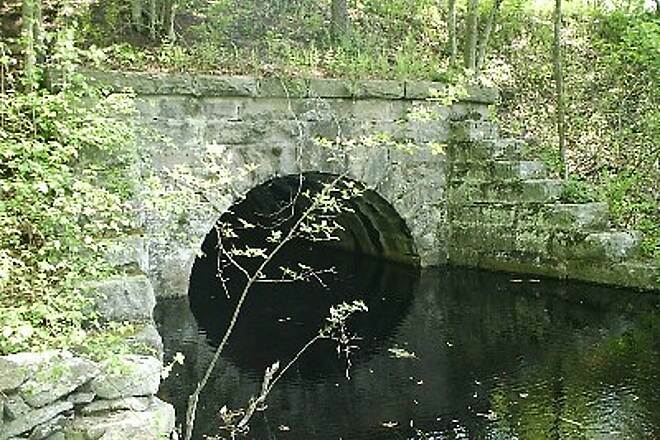 Former bridge abutment at Needles Eye Road, Pomfert, CT on 5/4/16. 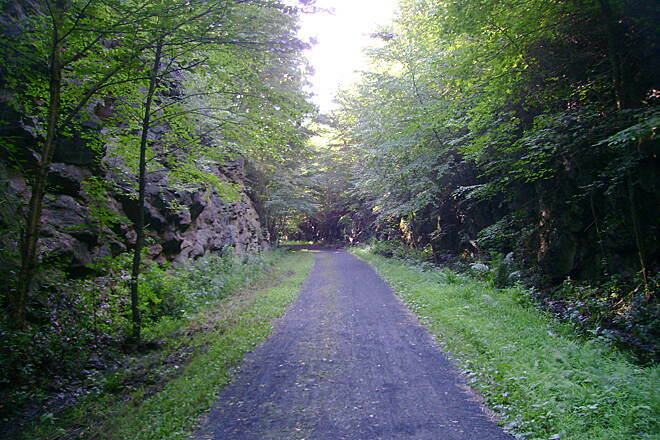 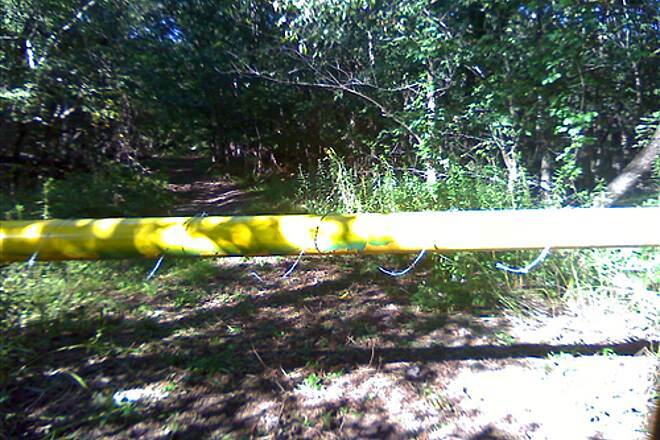 Trail bypasses on the north side. 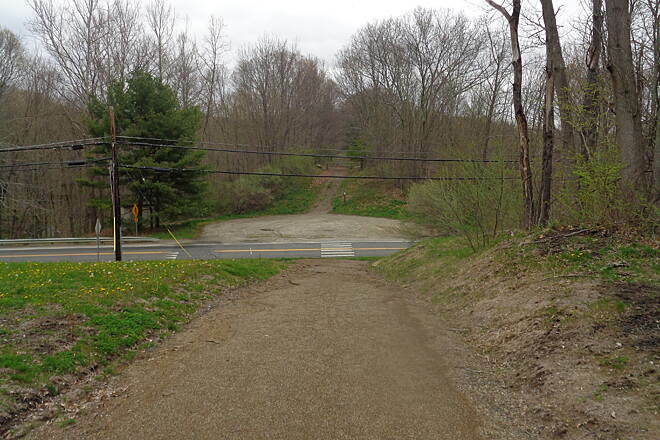 View of Air Line Trail looking east over Route US 44, former bridge site. 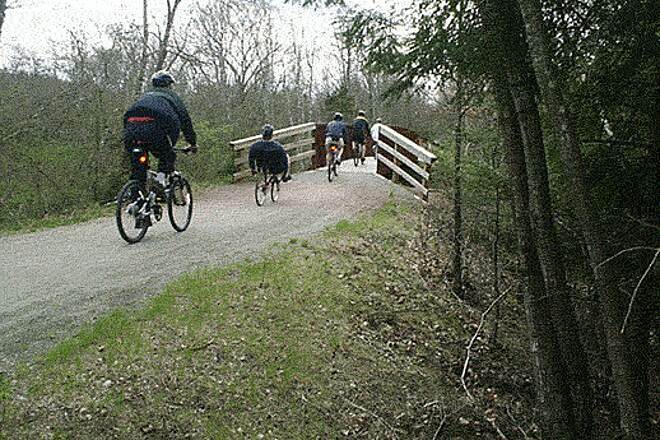 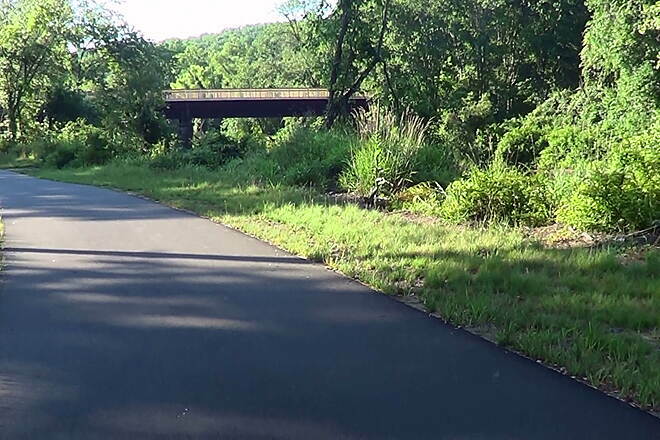 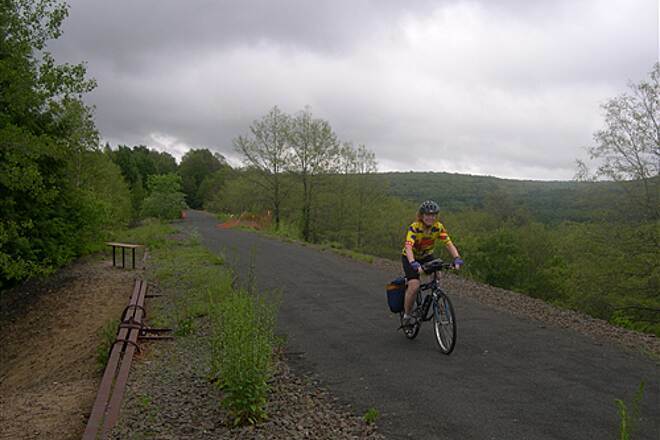 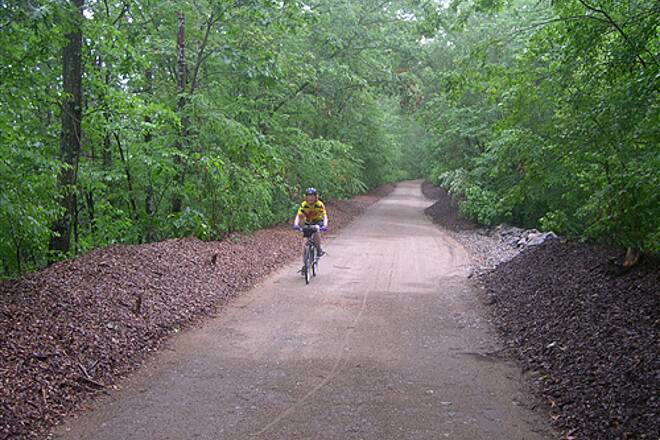 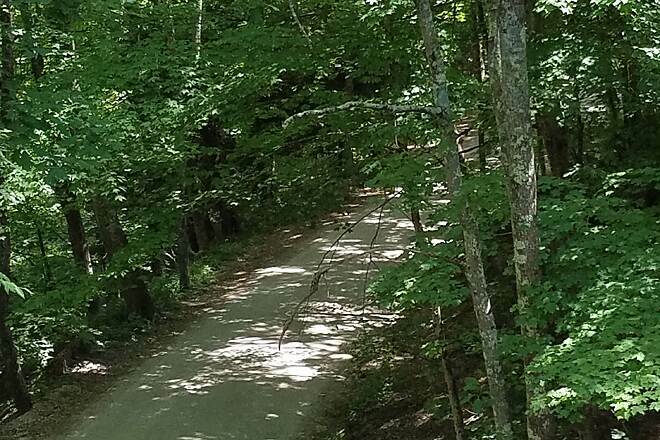 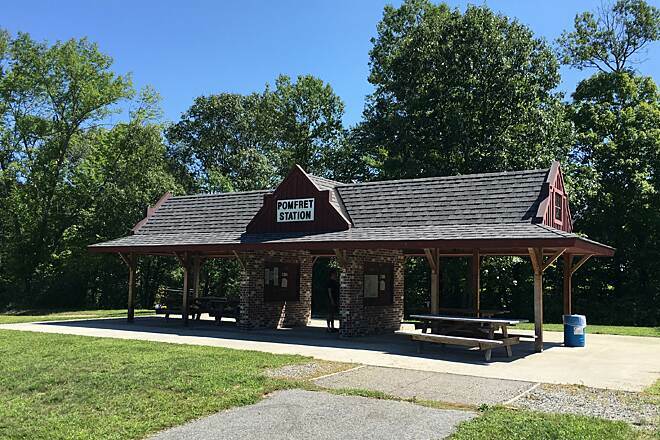 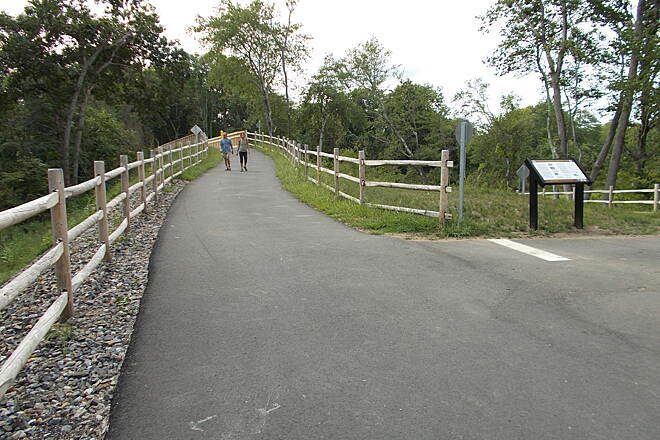 The Airline Trail South is now connected with the Airline Trail North with the completion of the new and beautiful Willimantic River Bridge. 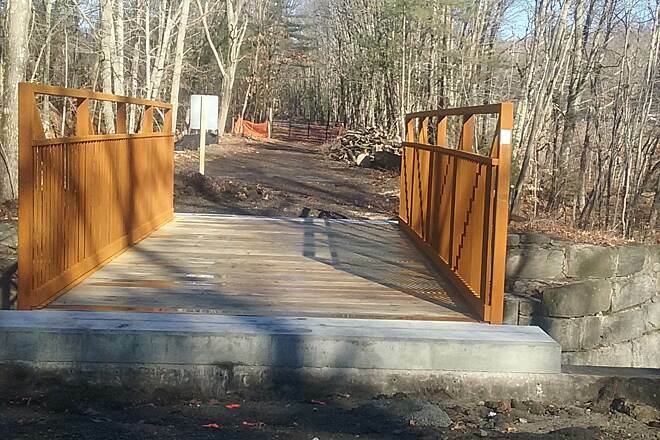 The new completed pedestrian bridge that connects Kingsley Road in Lebanon to the paved section in Willimantic. 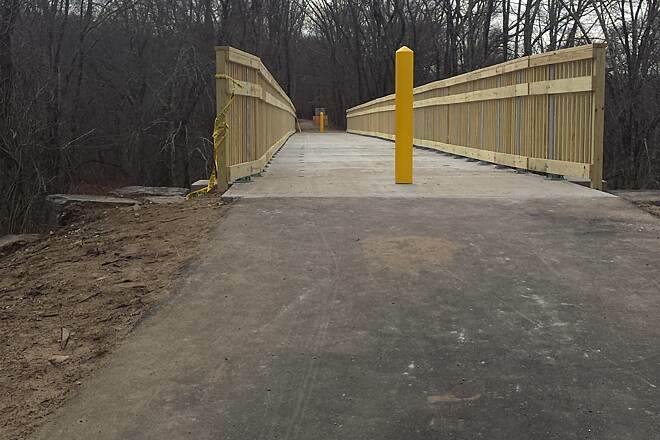 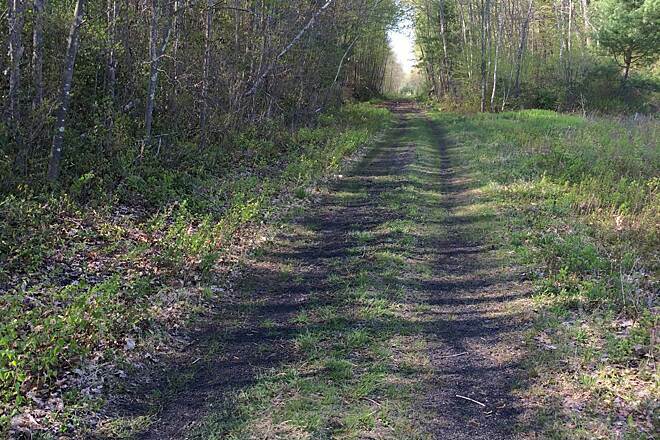 This is the new connecting trail for the Airline and Hop River Trails. 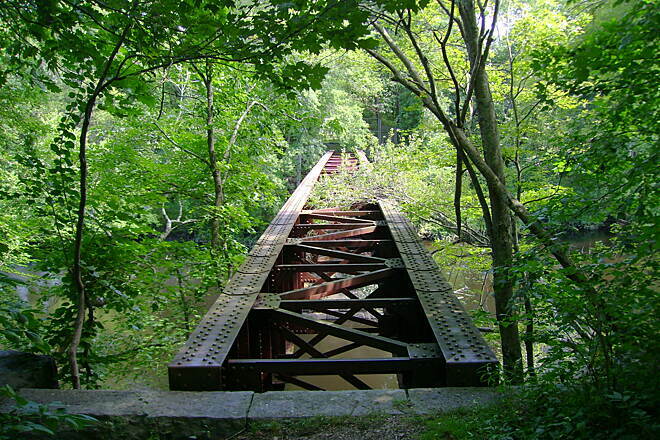 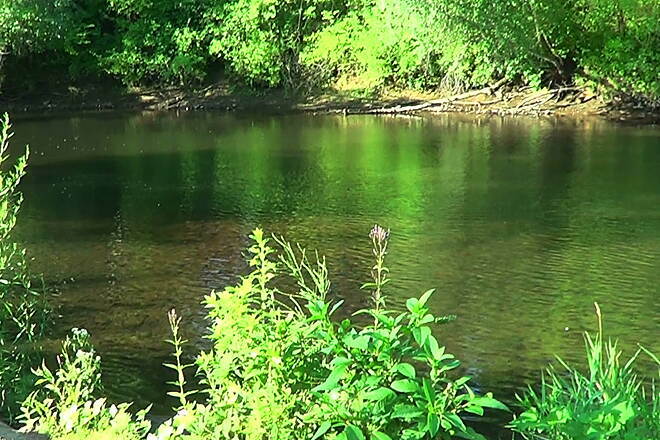 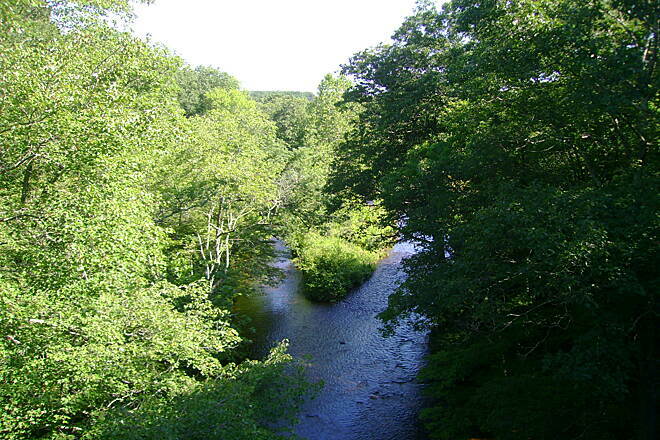 It follows the Willimantic River from Bridge Street to Rt 66 on the Columbia/Willimantic town line. 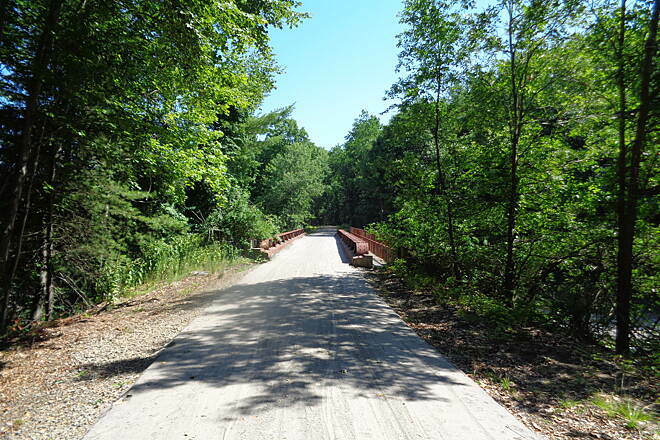 It is beautifully paved!! 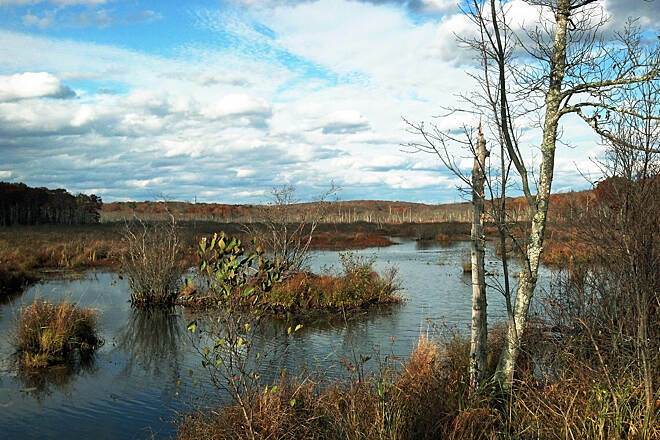 Late fall view of the Raymond Brook Marsh. 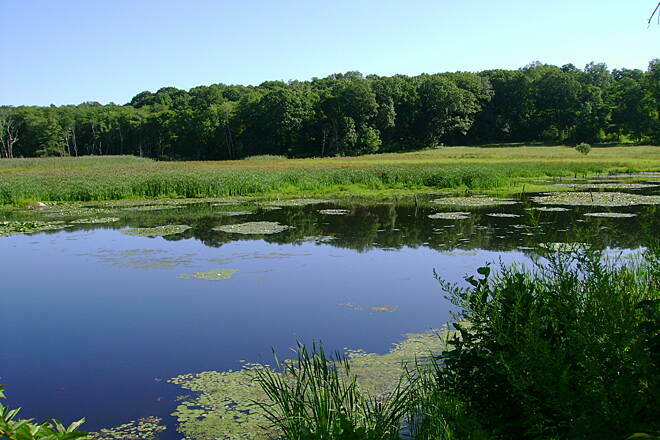 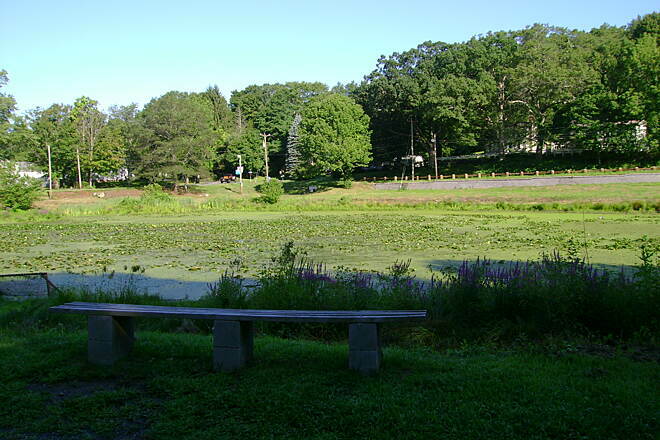 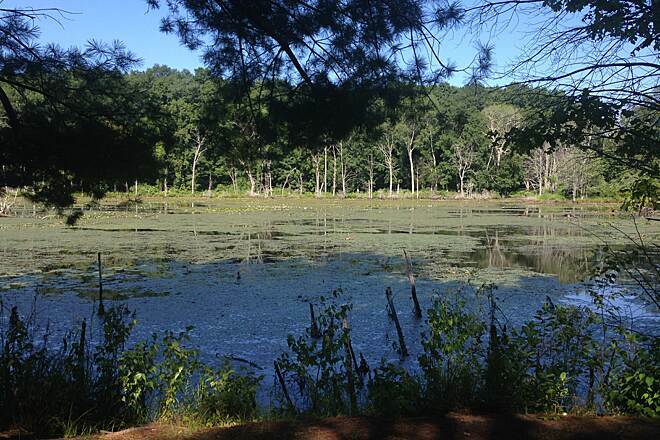 Pond between Grayville Falls Park and Day Pond Park along the Airline South in Hebron, CT. 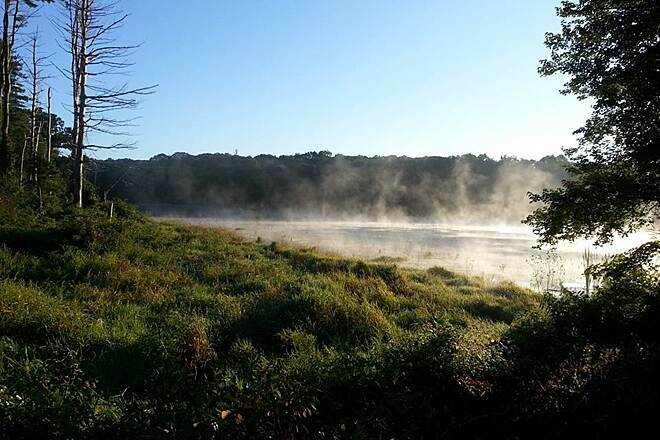 Early morning steam rising from the park at the beginning of a beautiful day. 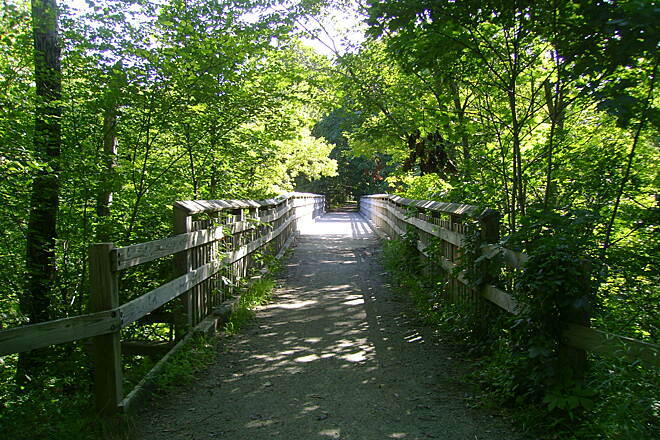 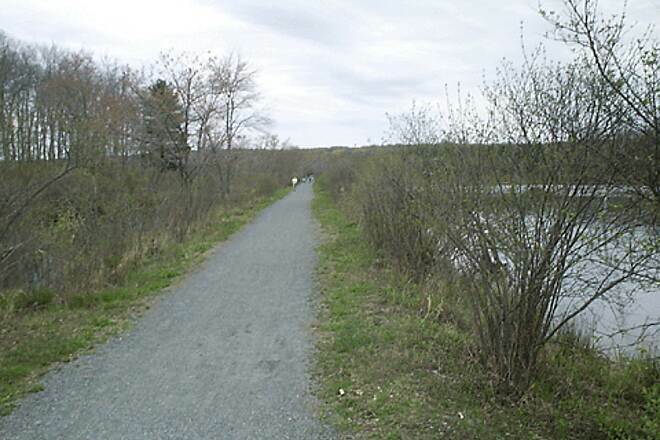 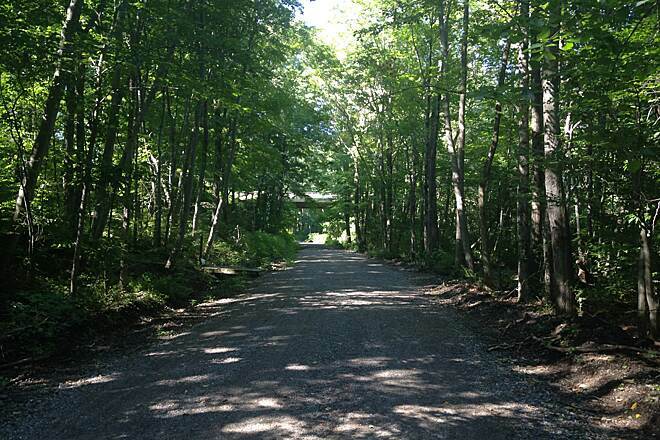 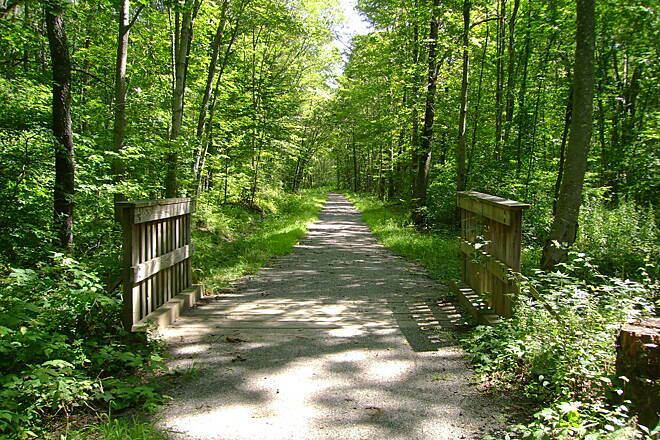 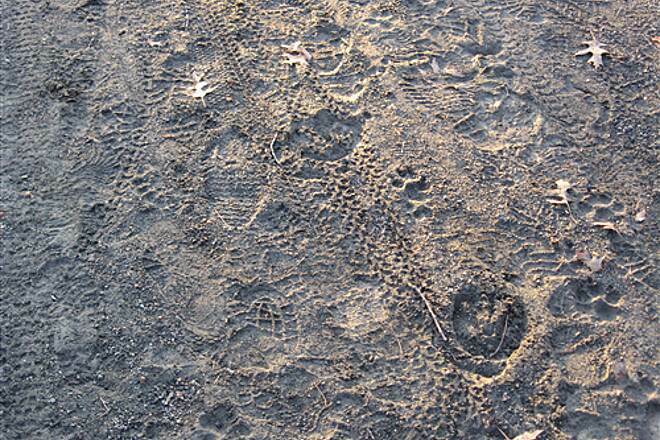 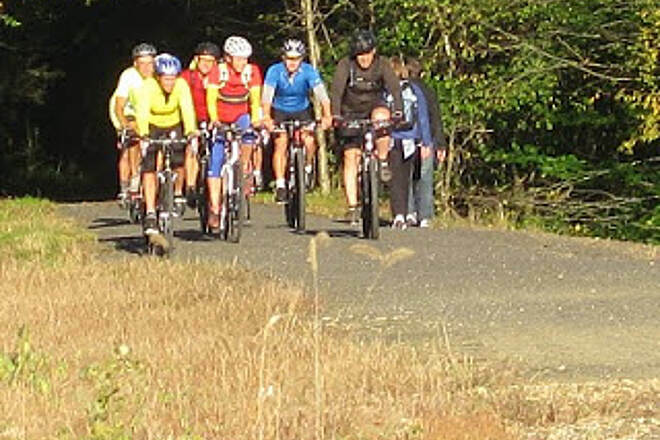 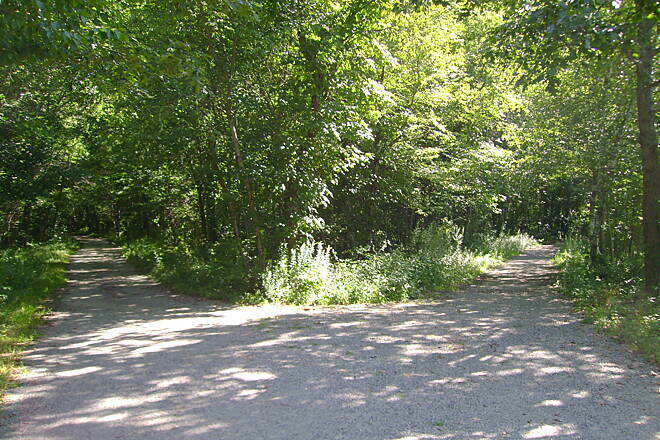 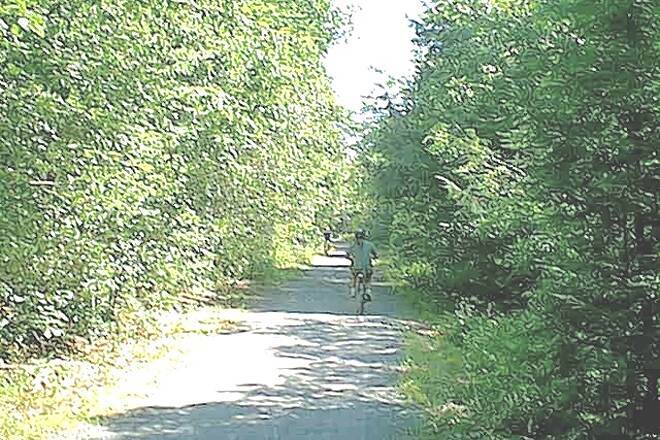 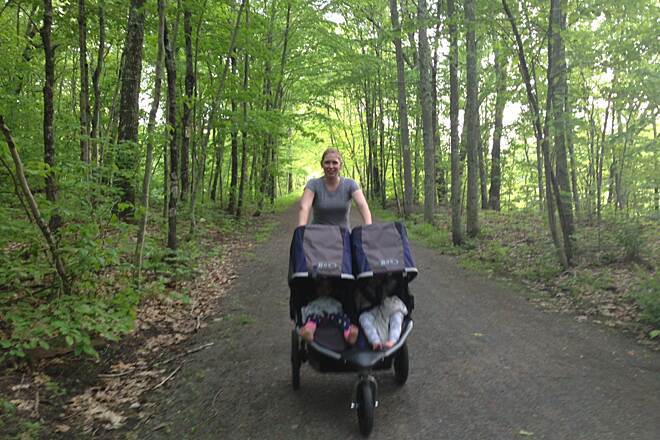 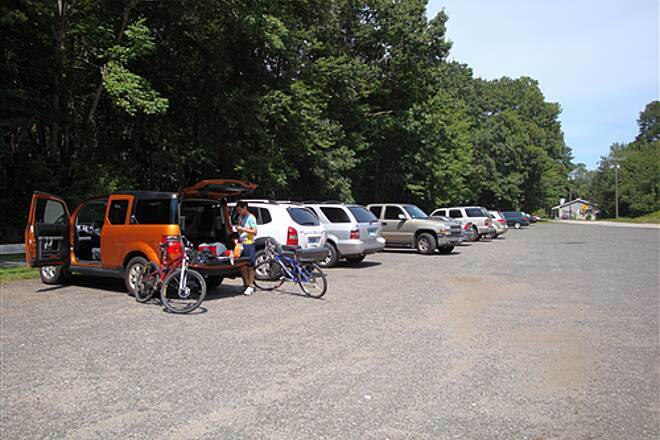 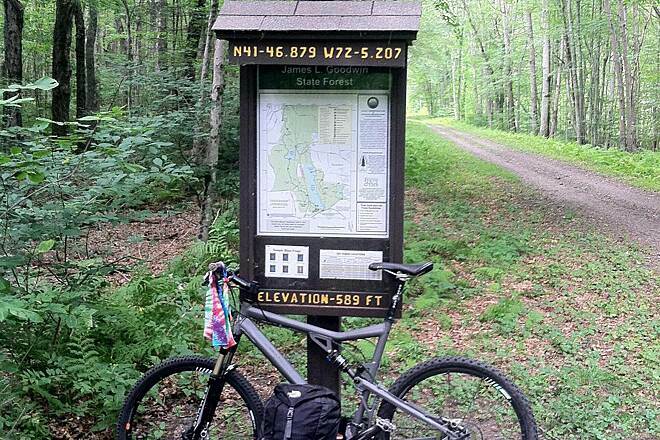 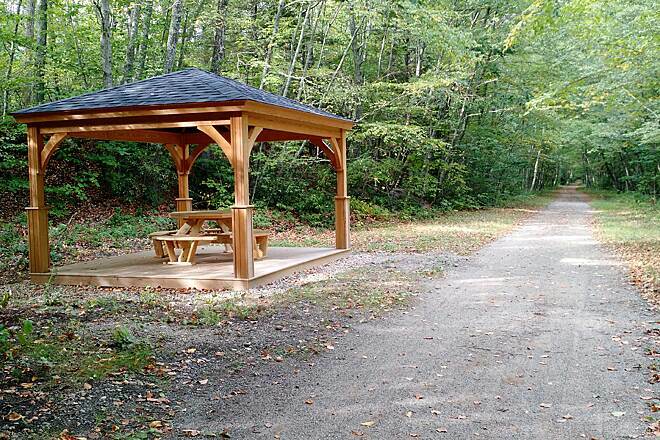 There is ample parking in Amston, the midpoint of this popular trail. 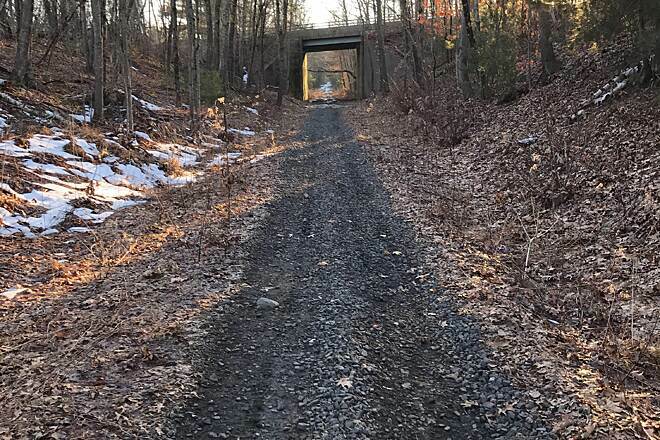 The embankment in the background carries the Air Line Rail Trail past these grazing cows, between Brooklyn Road and Route 97 in Pomfret. 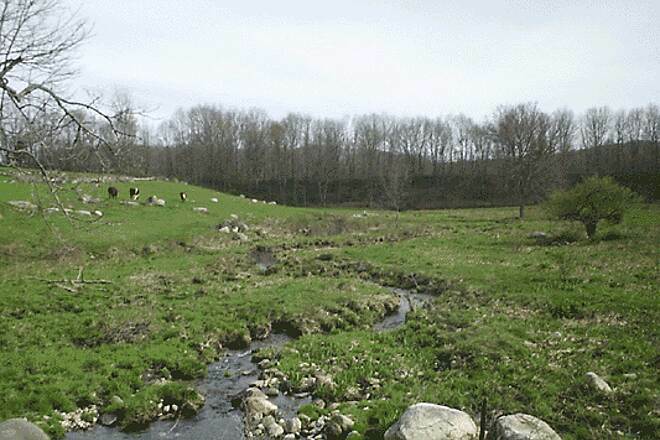 A double stone culvert provides the drainage from the stream in the foreground. 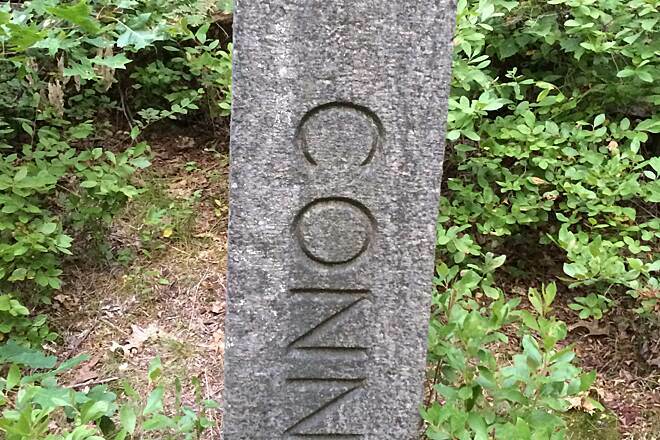 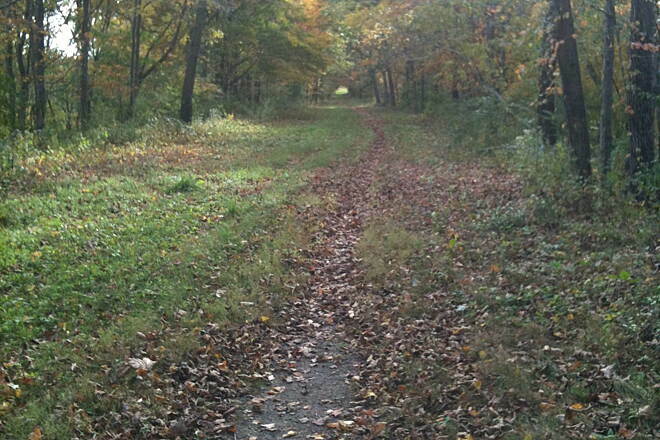 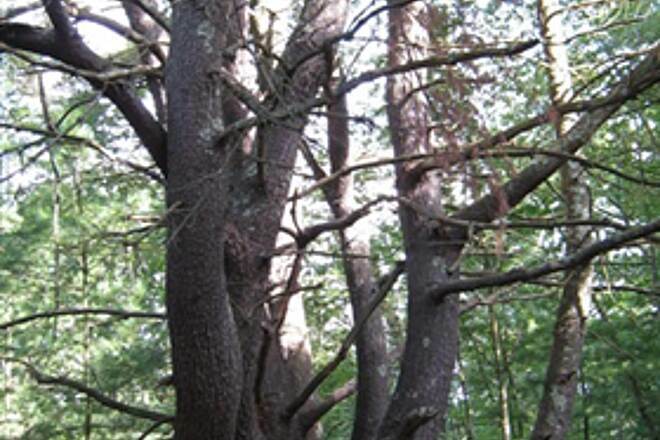 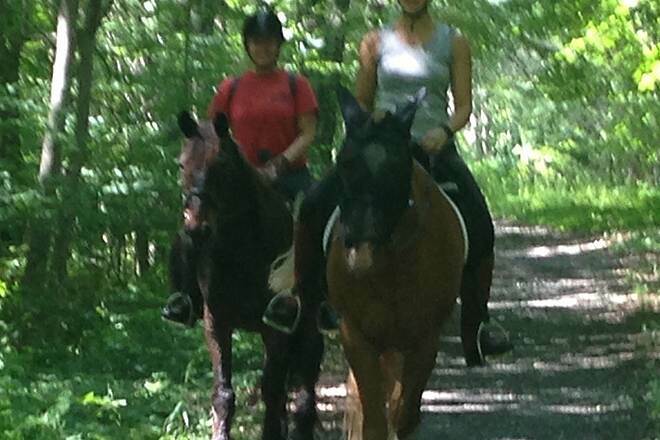 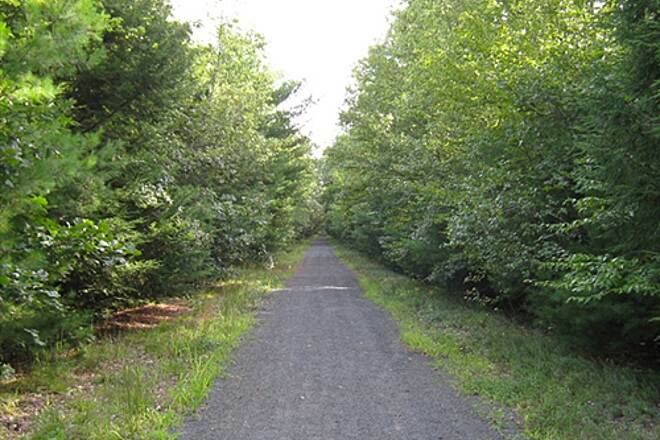 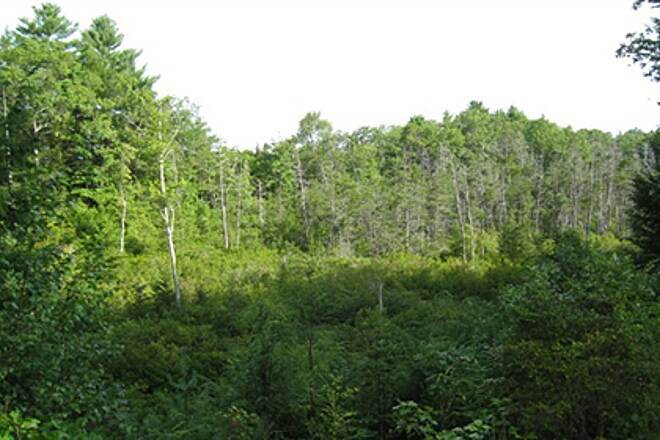 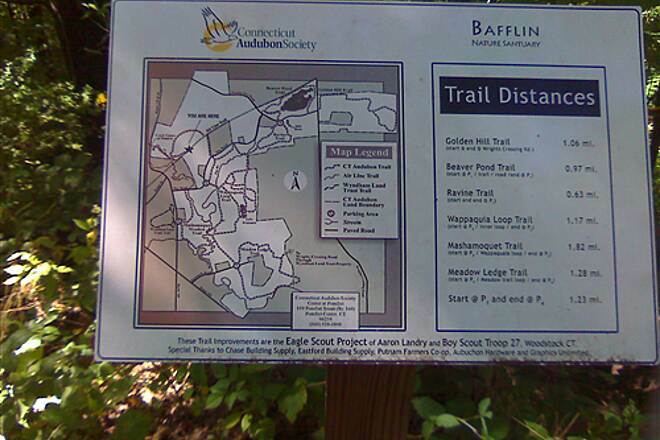 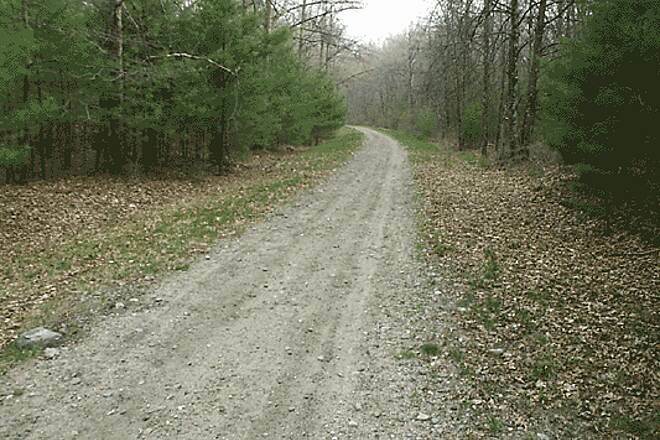 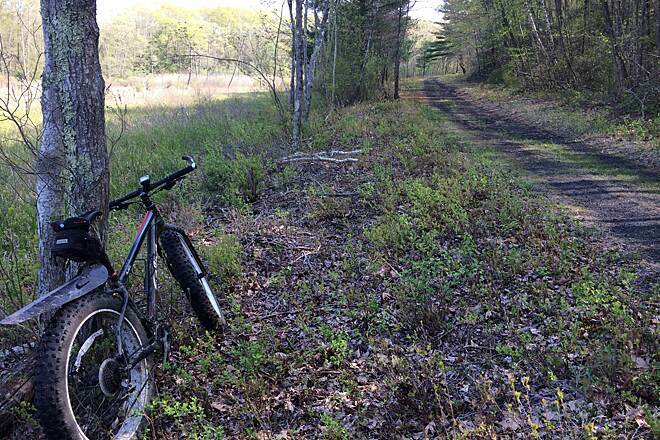 The trail is dry and wide in the Goodwin State Forrest, located in Hampton, CT. 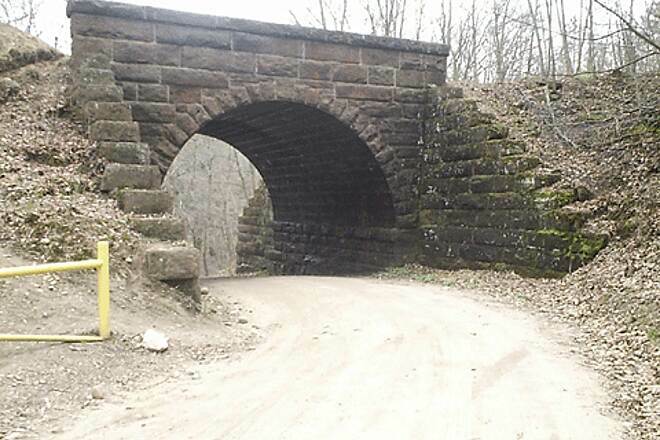 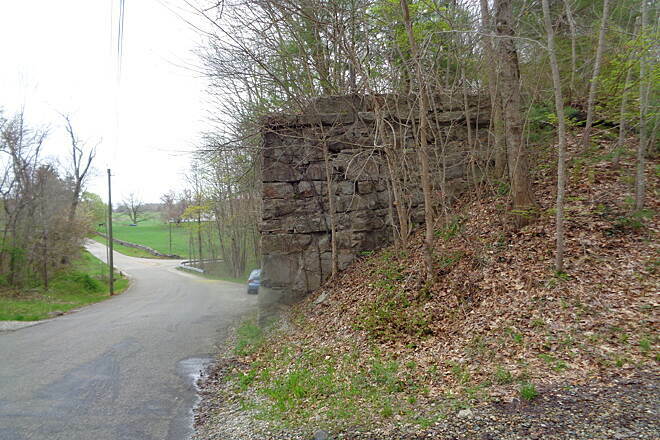 The Mashamoquet Brook passes through this huge stone arch bridge located about halfway between Covell Road and Babbitt Hill Road in Pomfret. 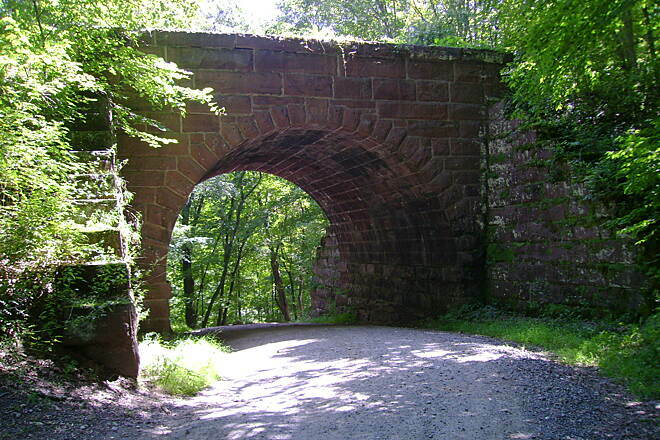 The arch is approximately 20 feet tall by 25 feet wide. 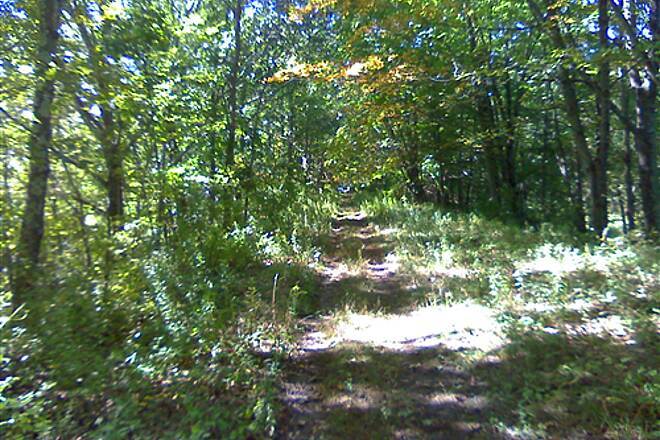 It is a steep climb down, but worth the effort. 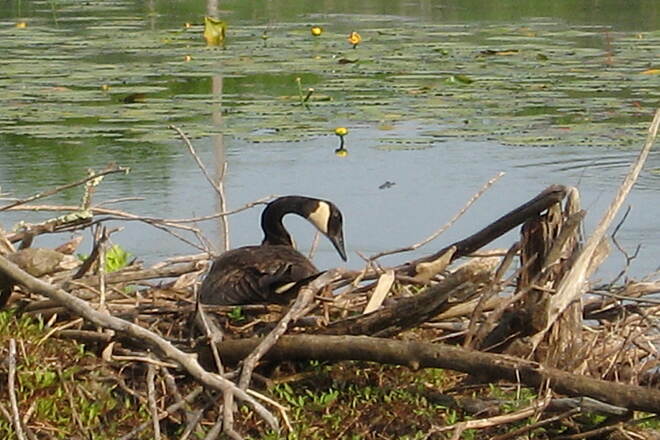 A thrilling view for a teenager, making her father somewhat nervous. 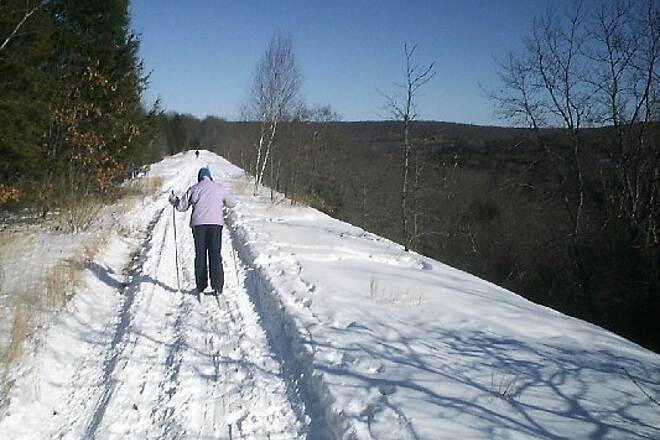 Winter and heavy snows do not stop the use of this trail. 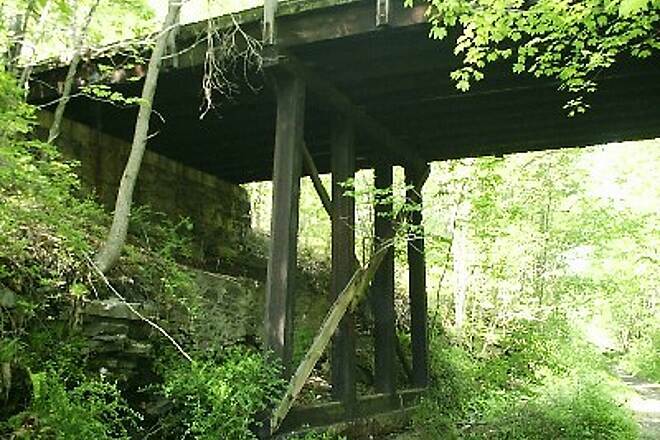 This is the east end of the Lyman Viaduct. 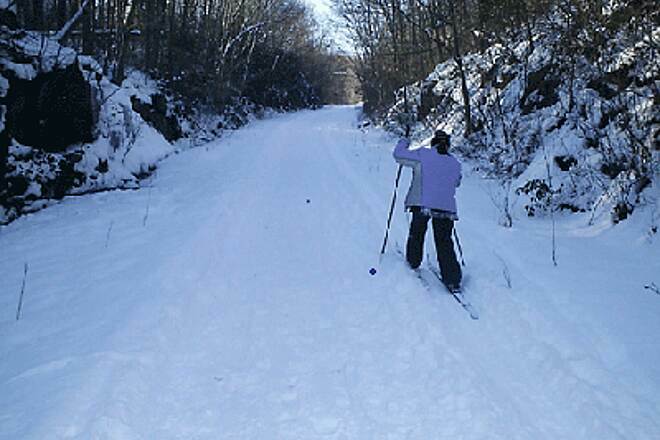 Winter skiing through a deep cut in East Hampton. 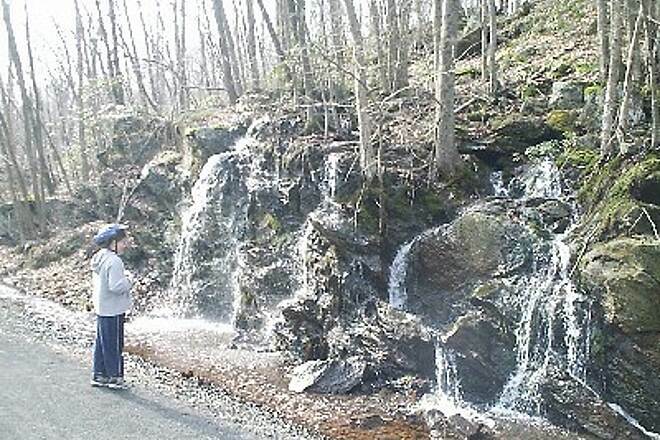 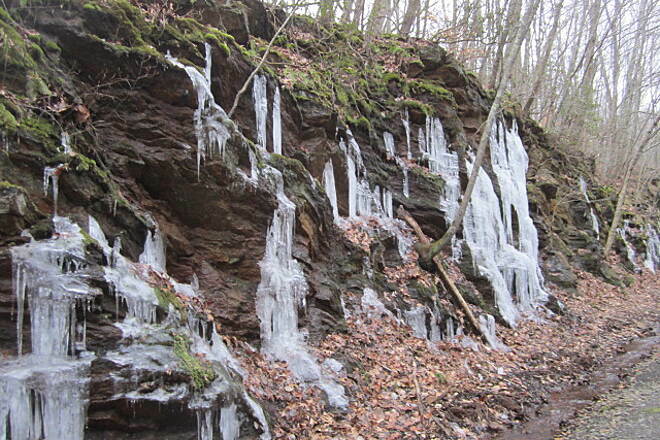 Heavy spring rains have created cascading waterfalls on the deep cuts of the trail in East Hampton. 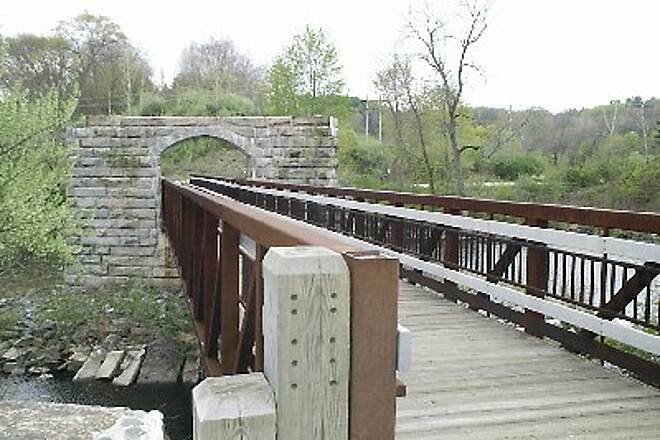 The rail trail passes over River Road in Colchester on this unique stone bridge. 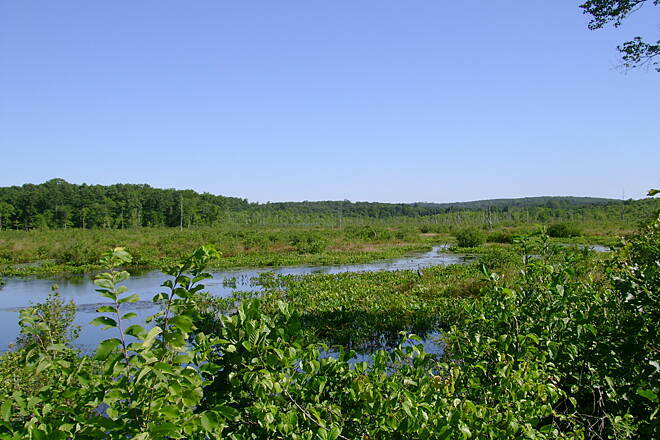 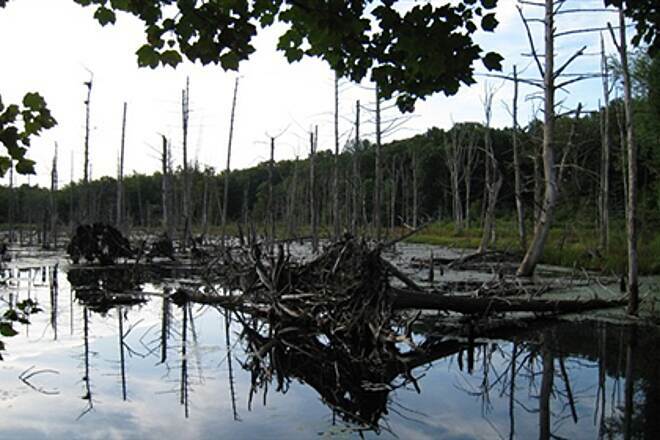 On both sides of the trail there are beaver lodges and dams. 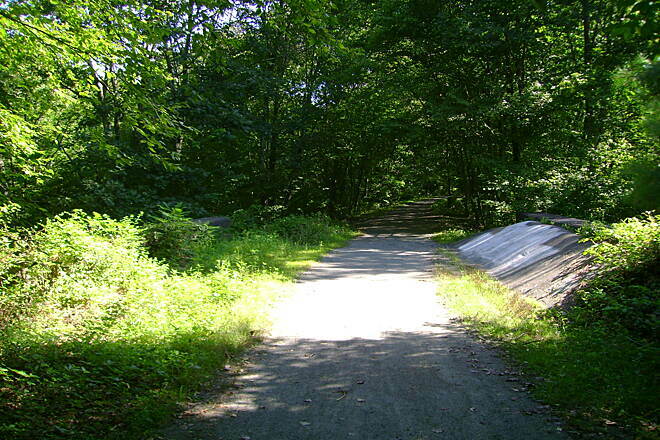 Passing through cuts in the bedrock offers cool relief on a hot August day.